Brrrrr! It is -30c today. With the wind it feels like -38c. So cold! So it's a perfect day to stay indoors and finish up some of my gifts and start on some baking. 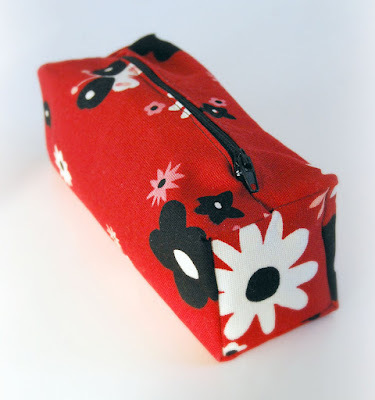 Lastnight, I finally got around to making this cosmetic bag for a friend's teenage daughter. I'm really happy how it turned out. It was my first time sewing on a zipper and I think I was swearing beyond belief. Hahaha! Well, it wasn't that bad, but zipper's definitely aren't my favorite things. 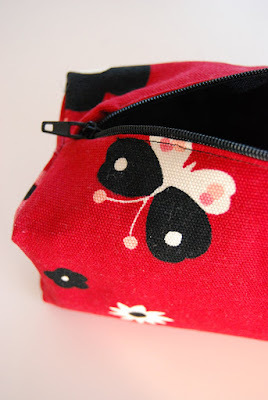 Here's a link to a great tutorial for making this bag. Now time to fill it up with some fun lip balms, funky nail polishes and other accessories. Thanks for using my makeup bag tutorial! You did a great job and I just LOVE the fabric you used! Merry Christmas :).